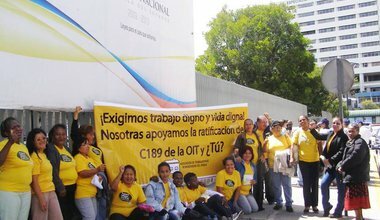 Lourdes Albán has been a paid domestic worker for almost 23 years. She currently combines office work with housework. She graduated from college with a specialisation in commerce and administration, and has taken courses in file management, commercial writing, basic accounting, crafts, dressmaking, and hairdressing, among others. She has been very active in and is currently an essential member of the Asociación de Trabajadoras Remuneradas del Hogar in Ecuador.